I absolutely adore comfort food on a cold Autumn Day, something both filling and satisfying. 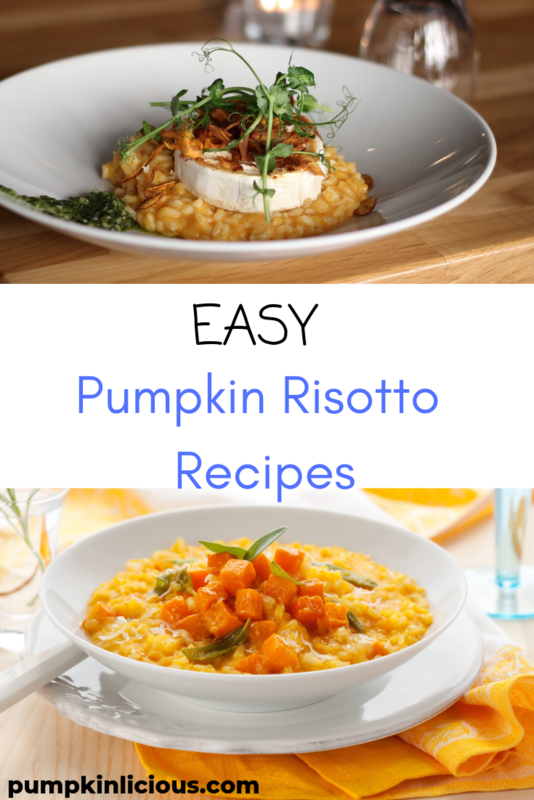 I had to share my favorite easy pumpkin risotto recipes with you all so you can experience the sheer delight of them! If like me you are short of time you will be pleased to know that you can whip up a delicious pumpkin risotto in no time. If you are frequently short of time when making dinner you might want to cook some pumpkin and freeze it for later use to save you time whenever you next prepare your meal. I have had so many people ask me what to serve with pumpkin risotto? What do they need to add to increase the taste, flavour? Can they make it vegan and does it work well with different meats. Pumpkin works well with lots of different ingredients as I have found out. I am going to break this post down into risotto recipes with meat, those with fish and vegan varieties. I know some people want meat but they don’t want fish or they want vegan and fish but don’t want meat, so feel free to skip to the ones that appeal to you. Chicken Pumpkin Risotto – a delicious and quick pumpkin risotto with tender chicken. Being a massive chicken lover I adore this and even give it to my kids. Creamy Maple Bacon Risotto – I have never tried this but goodness I so want my pumpkins to grow quickly so that I can whip this up real quick. Bacon and leeks work a real treat combined with pumpkin! You can also add sausages to risotto. You can add them whole or slice them up. I would cook the sausages separately first. Pumpkin Risotto With Shrimp – I am a massive shrimp lover, I would eat them by themselves but they taste so much better with other things. This easy pumpkin risotto has lots of flavour and includes white wine and some seeds to add to it’s nutritious value. Another delight with pumpkin is scallops. 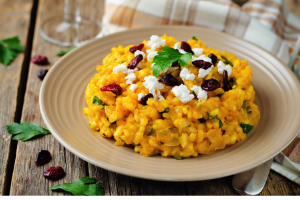 Vegetarians will be glad to know there are lots of great vegan pumpkin risotto recipes which taste just as good as the ones with meat, especially if you are a cheese lover! Speaking of which have you tried my divine pumpkin salad with feta cheese yet?! Thought not, no time like the present ladies and gents. Read on for some mouth-watering dishes. Slow Cooker Pumpkin Risotto – I know several of my readers have asked me for slow cooker pumpkin recipes and this is one I would definitely recommend. It is super healthy! 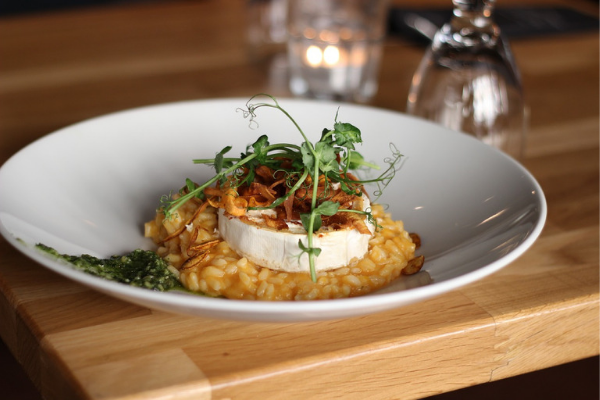 Amazing Pumpkin Risotto With Goats Cheese and Cranberries – how divine does not sound, plus it looks really pretty on your dinner table too. It would be a winner if you were having people over for dinner. The author even goes as far as to recommend what bottle of wine you should drink alongside this dish. Vegan Sweet Potato and Pumpkin Risotto – combined with garlic and nutmeg this is sure to keep everyone at supper very happy. I have to say when it comes to coming the most appealing, most delicious recipes Gordon Ramsay has nailed it with his roasted pumpkin risotto, sometimes he adds parmesan and sometimes mushrooms! I cannot believe he shares his recipe with us; I wonder would my version taste as good as his! Goodness I must have looked at hundreds of these recipes and I could not possibly feature them all here. I noticed some with green vegetables namely brussel sprouts and some with chestnuts! As I keep saying you can add so much to the glorious pumpkin and have a tasty and healthy meal for all the family. Which of these easy pumpkin risotto recipes are your favorite?